Wine and chocolate are always paired with romance which is why we love this sophisticated Valentine’s Day gift basket. Give your sweetheart your choice of three red wines, which we’ve expertly paired with a collection of fine chocolates. 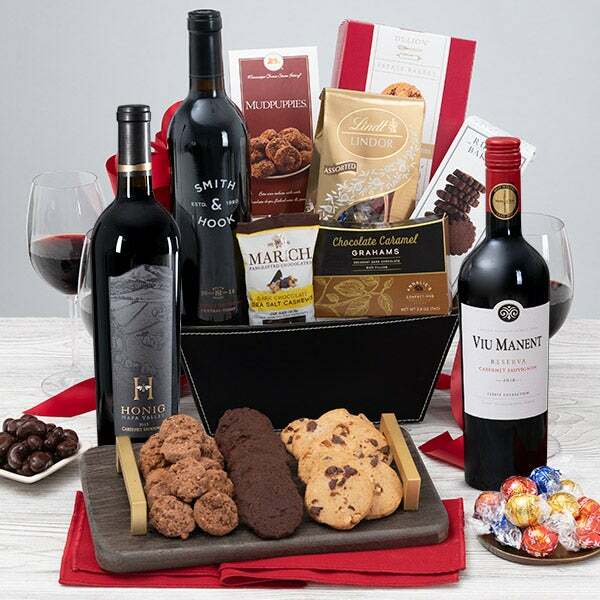 Sip your wine while you enjoy exotic Belgian truffles, rich squares of dark chocolate, and an assortment of sweets that will tempt your beloved’s taste buds. Sangiovese by Il Roccolo - 750 ml - Rich, spicy, fruit forward wine that's dark ruby red in color, and well balanced with bold hints of berry and violet. Malbec by Catena - 750 ml - An intense wine that's crafted in the foothills of the Andes featuring flavors of ripe plum and black pepper with a silky finish. Cabernet Sauvignon by Honig Napa Valley - 750 ml - This sustainably farmed big cabernet from a family winery in Napa finishes long with characteristics of black cherry and lavender layered with toasty oak. Belgian Chocolates by Annalie's Chocolates - 1.76 oz. - As beautiful as they are delicious, these decadent Belgian chocolate truffles will complement whichever red wine you choose! Dark Chocolate Squares by Ghirardelli - 5.25 oz. - Irresistibly rich dark chocolate squares that are crafted by skilled artisans. Milk Chocolate Sea Salt Caramels by Sanders - .5 oz. - Lightly salted caramels are coated in decadent milk chocolate. White Chocolate Cranberry Cookies by Kimball Lake Bakery - 4 oz. - Perfectly crunchy cookies are laced with sweetened dried cranberries and smooth white chocolate chips. Chocolate Wafer Rolls by Fusion Gourmet - 3 oz. - Delicate rolls of paper-thin wafers that are filled with exquisitely smooth chocolate. Chocolate Chip Cookies by Byrd's Famous Cookies - 4 oz. - Irresistibly crisp cookies that are loaded with real chocolate chips and baked until crisp. Chocolate Wafer Roll Petites by Dolcetto - .7 oz. - Pillow-shaped wafer cookies that are filled with irresistibly smooth chocolate centers.